Soly Cisse, b 1969 Dakar, Senegal. 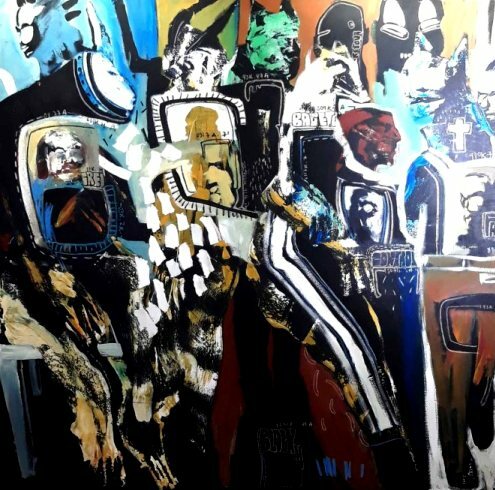 This multi-faceted, hugely talented contemporary African artist is first and foremost a painter... but he also turns his hand to sculpting, photography and video production. Growing up in Senegal under the effects of a politically unstable environment, his art became an impassioned outlet for his outrage against the social inequalities and injustices suffered by him and to others around him. 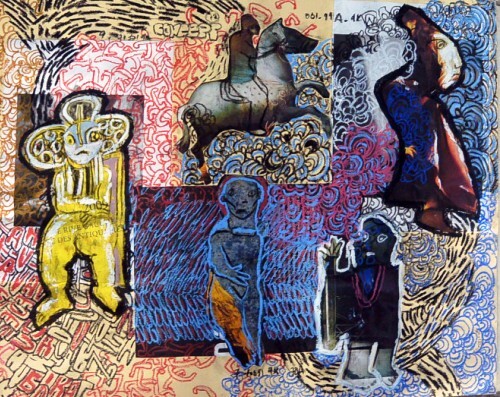 In 1996 Soly Cisse attended the School of Beaux-Arts in Dakar and by 1998 his work had already been included in 2 Biennales in Sao Paulo, Brazil and hometown, Dakar. 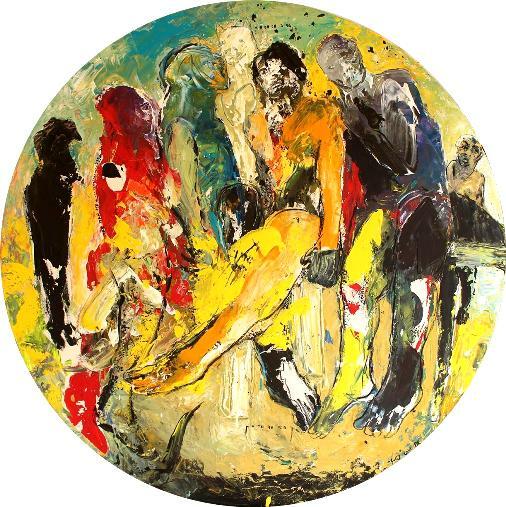 He has regularly been an exhibitor at world wide shows including Africa Remix and he has had numerous group and solo exhibitions in cities such as Madrid, Tokyo, Cape Town, Paris, Beirut, Lisbon, Brussels, Seattle, London.. to name just a few. His art expresses a brand of personal mythology that incorporates hybrid animal and human forms along with skulls, artifacts, geometric or abstract shapes. Random drawing lines and drips of paint add textural layers and complexity to his work while sequences of letters, numbers and bar-codes bring tension to the piece. 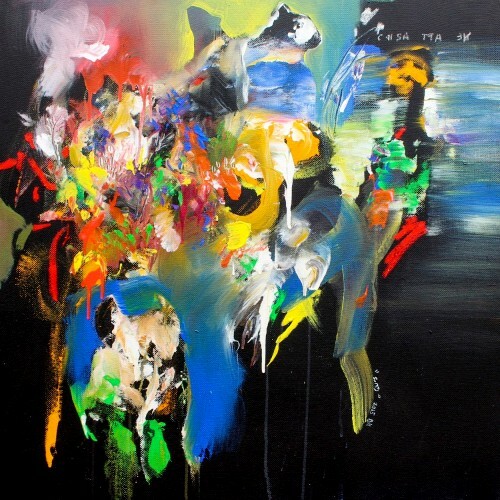 Using acrylic paint and mixed media on canvas or paper his work is sometimes fully abstracted with grand gestural strokes set against explosions of raw energy and colour. One can feel the fury, the spontaneity of expression and the drive to create something powerful; be it in the process or in the end result. His work intuitively explores the duality of traditional and modernity, the spiritual and the secular but these days, his confrontation is directed more against humanity's arrogance and lack of consideration towards the earth's environment and nature in general. Sometimes his work is more restrained and contained especially when working on paper and a more graphic, considered element is achieved. 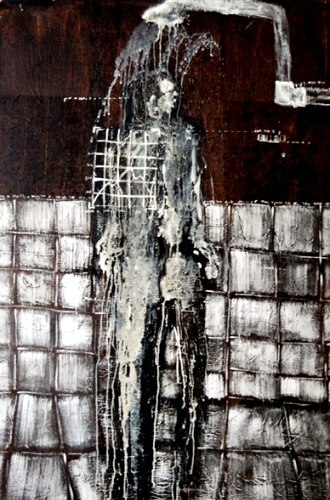 The monochromatic piece above shows his mechanisms of layering human forms on top of grid patterns interspersed with movement and fluidity of paint. Below is an iron sculpture which manifests his mythological creatures into figurative reality. 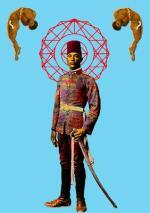 Currently he is represented by Sulger-Buell Lovell in London and Cape Town, Ed Cross, London and Galerie Arte, Dakar.